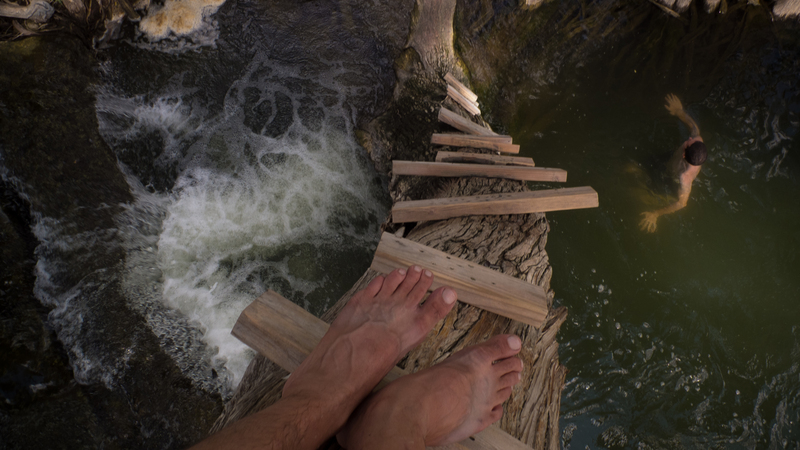 The swimming hole at Utopia is punctuated by a large dead tree that supports a genealogy of rope swings- smaller segments of rope are each tied to larger pieces where they broke off. Sisal meets cotton and marries nylon and polypropolene in a literal and figurative family tree. The ladder up the tree is an equally mixed affair- wooden slats meet an welded steel ladder that is occasionally held together with zip ties and electrical wire. But that isn’t the most frightening part. Once at the top, you come to the realization that people must’ve jumped from there. Less than a mile upriver the San Marcos doesn’t exist. It comes springing up out of the ground all at once in one of the largest springs anywhere. By the time it gets to Rio Vista the water is still incredibly clear and surprisingly cold. It runs at about the same rate all year every year. It is not slowed much by drought or boued much by rain. The history of Rio Vista is interesting. Like many spots on Texas rivers a short dam used to be here. The dam generated no electricity and generally served no purpose other than to make the river above it a little slower and a little wider. Like many of these short dams this one over the years had grown structurally unsound. The city of San Marcos was deciding if they should replace it before it fell down on its own or just tear it down. A group of kayakers had other plans. They lobbied to replace the dam with a series of three drops, each progressively smaller than the first. They added artificial boulders to create nice currents know as eddies. Soon after opening they actually held Olympic trials qualifier runs at the site, complete with slalom gates. It didn’t take long however before tubers decided it was lots of fun to go over at the end of the Lions club tubing shuttle. Locals also like going over it without a tube and swimming in the whitewater current despite the danger of swift water. 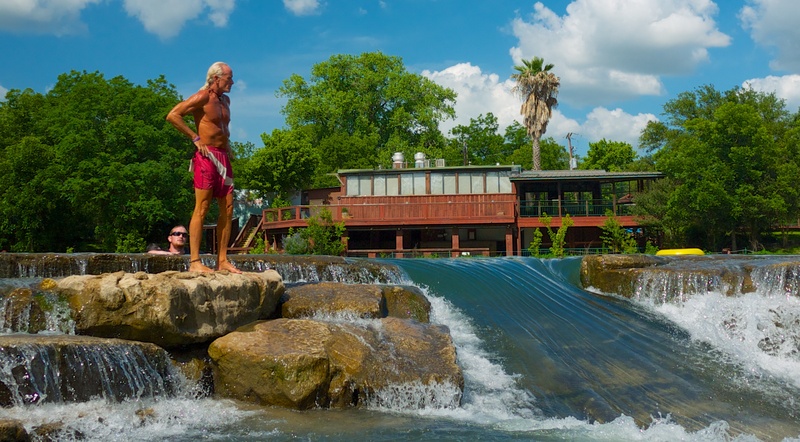 Soon the swimmers took over the warmer months and whitewater kayers were relegated to using Rio Vista at night when it is lit up by flood lights and during the cooler months when swimmers trade in their bathing suits for textbooks. The Hill country runs into west Texas right here. This is the last stop on the interstate before things just get flat and dry. That might explain why this place remains a secret. Lots of trees, lots of hills, and a river that flows clear and cold. If you ever want to go tubing without the crowds this is the place. There are publicly accessible put ins above and below the State Park and a few places in the park itself. You can have any length tubing you want. Many people choose to just float in the slower sections of the river, wade in the faster moving sections, or just hang a hammock under a tree. It is not every lake that is owned by a school District. 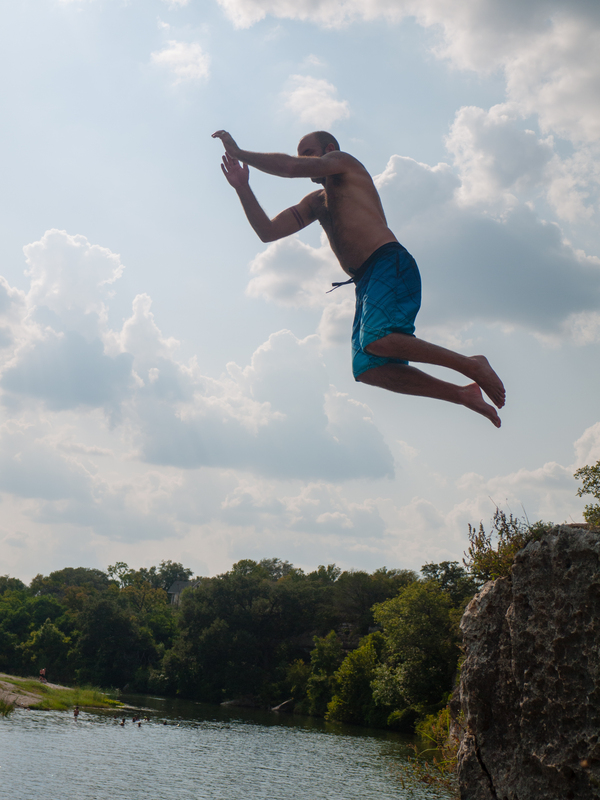 Being owned and run by teachers isn’t the only unusual thing about this swimming hole. Lake Tejas is also a spring fed lake, but isn’t clear. The color would be clear except for an unusual brown picked up from the tannins of the pine needles in the area. Sandy beaches, an amazing water slide, fun inflatables, and the old school peddle boats that take lots of energy and barely move are among the highlights. Going to this lake is like stepping back in time to a summer camp, we kept expecting a game of tug of war to break out. 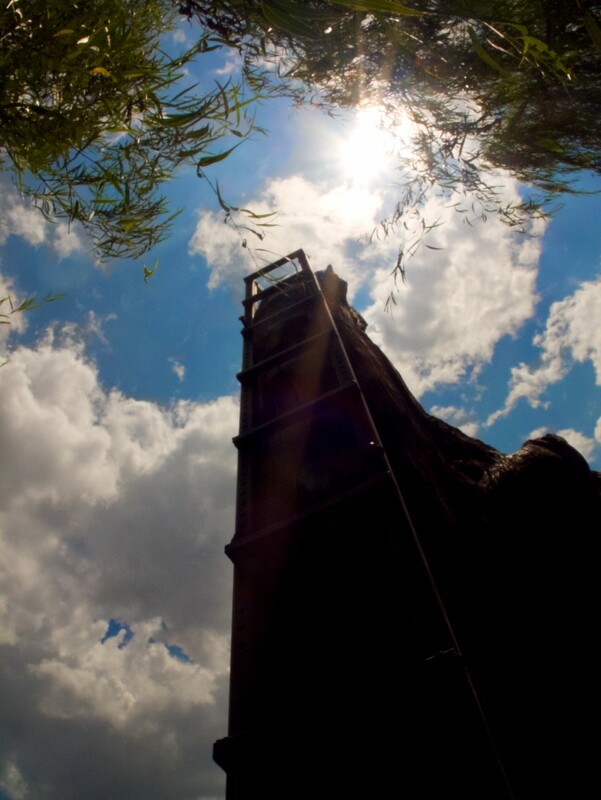 On the weekends, Twin Falls is undoubtedly a hangout for college ages kids and younger. Tattooed, sunglass wearing twenty-somethings with boom boxes, 12 packs of cheap beer populate every niche on the rocks. Hip hop and cigarette (and other kinds of) smoke waft through the air. But if you wade through the throngs of people and dogs and the falls are superb. There are pockets of limestone just large enough to sit in, make for a natural water massage. The pool below the larger fall is almost always deep enough to jump off of and the quick access from the road means that you’ll be going from roasting to chilling in about 15 minutes. If you’d like to do a little civic experiment, bring a small trash bag and pick up some trash. You’ll be surprised how well leading by example work- others will soon follow. On weekdays, the place empties out- like a nightclub turning into a monastery. If you’d like to combine a hike with a swim, start out at the 360 access turn left at the trail and walk about a mile to Twin Falls. 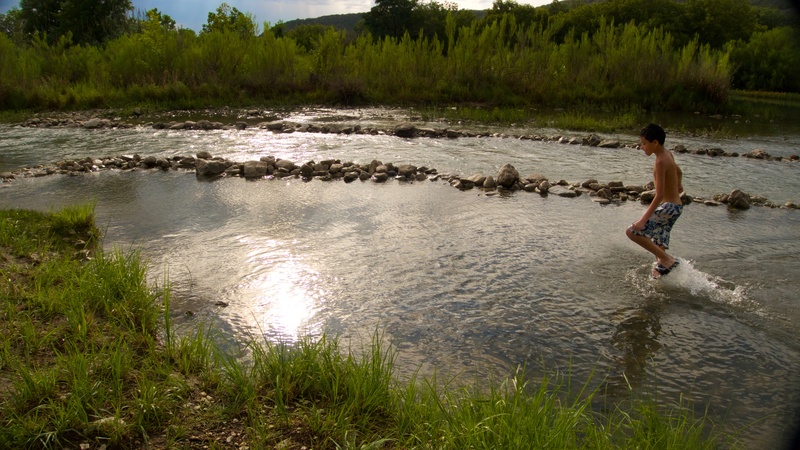 The upper stretches of the Guadlupe river are some of the most beautiful swimming holes in Texas. Most of the river is privately owned and you either have to rent a cabin or know somebody. However, Hunt Crossing is open to the public. It is located a short drive west of Kerrville and a short walk from the historic Hunt store. Nearby are Shumaker Crossing and Ingram Dam to fill out the trifecta of a day. Hunt Crossing is very rarely visited by those who live farther than Kerrville or Hunt but it is famous among locals. 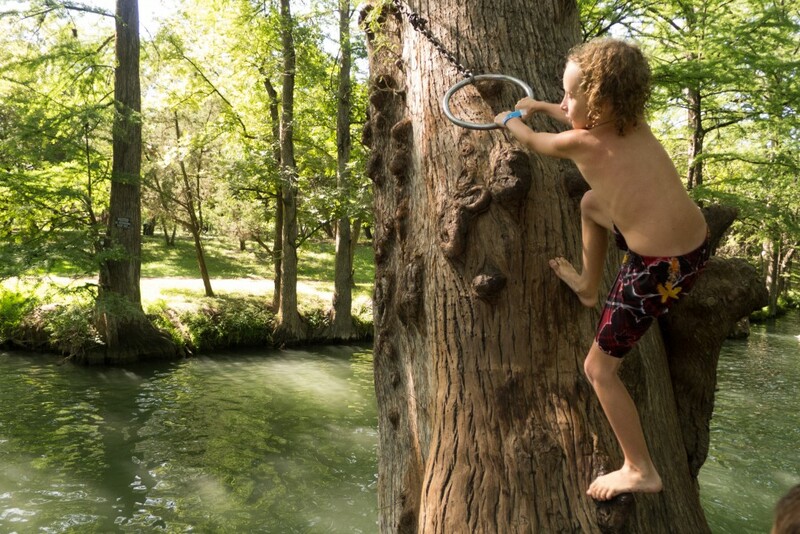 It ticks a lot of the boxes we look for in a good swimming holes: Good shade from tall cypress trees, wooden steps up those trees, a rope swing, free entrance, never fills up so you don’t have to worry about getting turned away, nice flowing water, and a feeling of adventure. 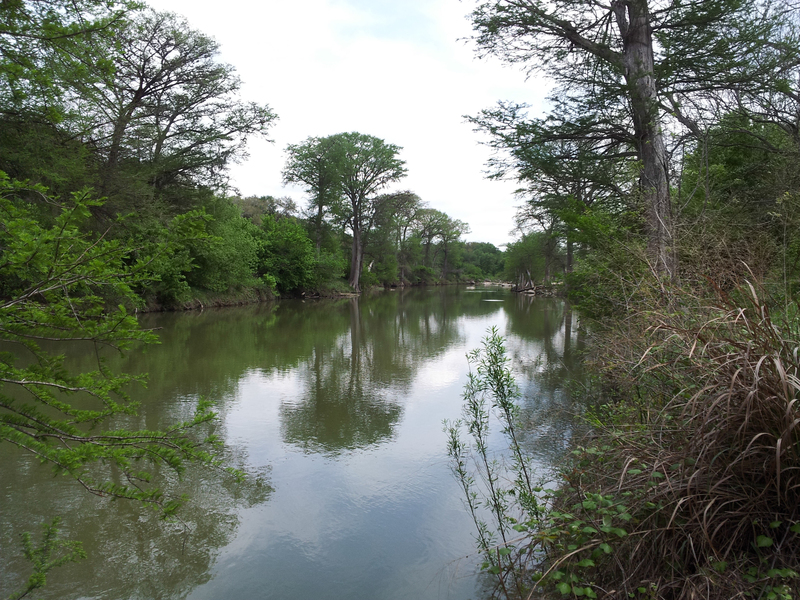 The Guadalupe River above Canyon lake is a beautiful thing. Lined with Cypress trees and refreshing water. Guadalupe River State Park is indeed beautiful. It is also too conveniently close to San Antonio and thus It is also a study in how to fit a massive amount of people into a quarter mile stretch of river. If lots of people are your thing or you have the flexibility to go on a weekday this is a great park worth visiting. A short hike along Spring Creek reveals the beautiful pink granite boulders quietly baking in the hot sun across the lake. This is the type of swimming hole that embodies the seriousness of swimming holes: leave your towel, backpack and water bottle at the shore and swim across to the pink granite boulders. There are a few things to know about granite, it is sharp, hot and gets slick when wet. Jumping off the rock takes some quick learning. Hopefully, there are some teenagers around that will let you know the best spot to launch from. Swimming holes in Texas are very popular, and many of them can fill up on a Saturday to the point they turn away cars. Blue Hole is no exception to that rule. The parking lots get full, the sunbathing field gets covered in picnic blankets, the cool water has a lot of heads, the rope swings always have a line. Yet, the place would feel empty without people. People are what makes this place fun. People add to the experience instead of detracting from it. Teenagers running and jumping to catch the ring on the rope swing in mid air. Younger kids holding on to the low swing before inevitably falling off early. The college kids throwing a frisbee. The family wading in the shallow end. The middle age couple floating in the deeper water. The single woman reading a book on the grass. The crowds at Blue Hole do more than share the space, everybody is a part of the space. Then the space becomes a part of them. We aren’t sure why crowds at one swimming hole make the place feel awful and at another place make it feel alive. 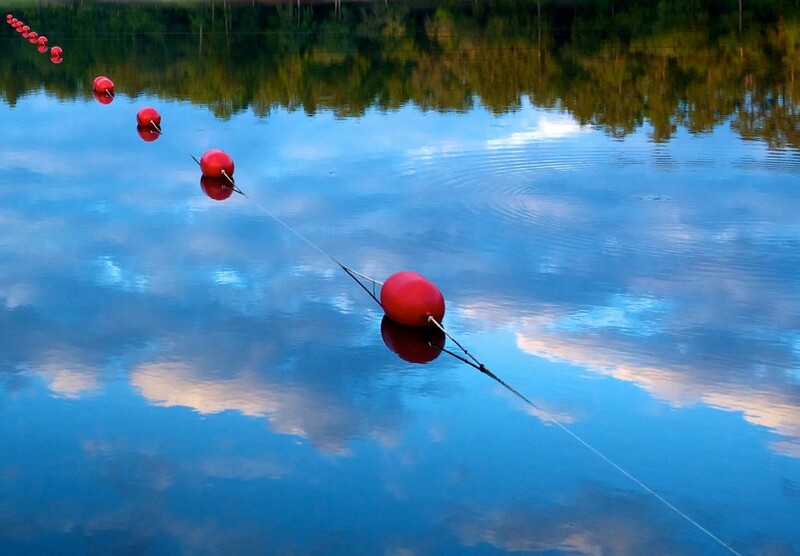 Whatever mysterious forces account for that feeling takes Blue Hole has the magic. There are many great mysteries in life, and why on a Saturday afternoon in the middle of summer Blue Hole will have only ten or fifteen people in it ranks as a real brain teaser. The parking is close. The entrance is free. There are picnic tables under giant oak trees. There is a restroom with running water and water fountains. There is deep water above the dam and shallow water below the dam. The river there stays running through the worst of droughts. There is a nice walking trail that follows the river. It is close to where a lot of people live. If you made a tick list of good swimming hole qualities Blue Hole in Georgetown ticks all the boxes. It may just be that a swimming hole simply does not fit in with the culture of Georgetown. This is a city that operates six swimming pools. The residents choose to pay money to swim in chlorinated and filtered water in an environment with rules and lifeguards. Meanwhile, a free unmonitored natural water swimming area remains almost deserted. Georgetown is a suburb that emphasises order and conformity. In fact, when you visit Blue Hole there are not signs in the park welcoming you, instead there are numerous metal signs on metal poles warning of all the rules you could be breaking. Signs for curfew in the park are only outnumbered by signs warning you not to jump off the cliffs. Fines for disregarding the curfew or jumping off the cliff are clearly stated. These cliffs have man made stone stairs to the top and are worn smooth from decades of people jumping off of them. Most of those observed swimming can also be observed to also be engaging in non-violent civil disobedience by jumping off the cliffs. Parents can be seen teaching their young children that obeying unjust laws only perpetuates injustice. 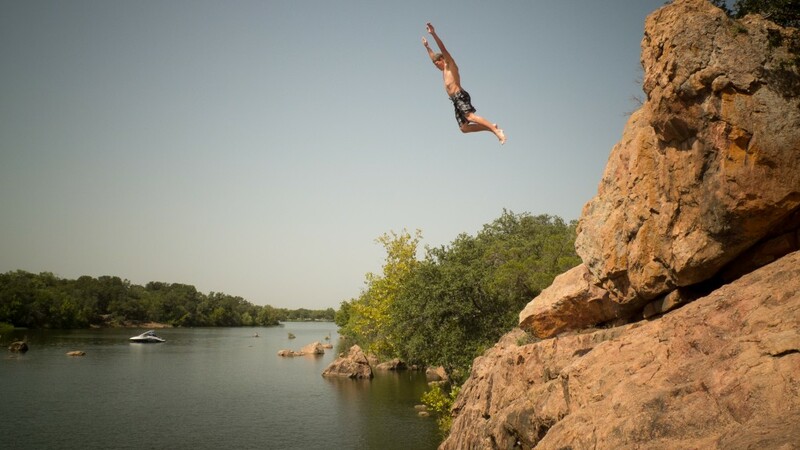 Every splash becomes not just about the fun and adrenaline of cliff jumping, but takes on larger significance of defiance on impingement of personal freedom. This attitude of thumbing your nose at authority inherent in Blue Hole may start to explain why the law abiding residents choose to stay away. It would be hard to swim in such a swimming hole and see others breaking the law jumping off the cliff one after the other and to restrain yourself and stay just in the water.